Ruby M. Gangloff, 80, Plymouth, passed away in her home at 11:40 p.m. Thursday Jan. 18, 2018. Born in Vallonia, she was the daughter of Francis M. Humphrey and Virignia L. (Davidson) Humphrey-Schwein. 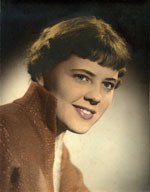 She graduated from Vallonia High School with the class of 1955, where she received a full academic scholarship for college. She attended Indiana State University for two years and was the 1956 homecoming queen. On July 5, 1957 in Plymouth, Ruby married Jim Gangloff. He would proceed her in death on Nov. 29, 2008. She retired after nearly 29 years of working for Nipsco as a senior customer service representative. She was a member of Pretty Lake Trinity United Methodist Church in Plymouth, a retired member of the United Steel Workers of America, a member of the Indiana Sheriff’s Association, the National Rifle Association, We the People of Fulton and Marshall County and the Gamma Gamma Chapter of Sigma Kappa Sorority. She was also a former member of the Women of the Moose. Ruby enjoyed making crafts, being a seamstress, oil painting and playing the piano. Gangloff had a green thumb for gardening and loved flowers and butterflies. She was the monitor of an internet garden group that grew heirloom tomatoes, from seeds. She, at one point, had 30-40 different varieties of heirloom tomatoes, none of which were hybrids. She and Jim also canned, having over one thousand in stock to share with family and friends every year. She loved her children and grandchildren very much. She enjoyed teaching them the things she knew and making memories with them. She will be dearly missed. Gangloff is survived by her sons, Tim R. (Julie) Gangloff, Chester, Ill., Tom Gangloff, Bourbon, and Ted (Tammie) Gangloff, Plymouth; four grandchildren; and seven great grandchildren, Wes (Jess) Wallace, Avilla,and their children, Nevaeh, Rylan and Abel; Clint (Mel) Gangloff, Copperas Cove, Texas; Katie (Alex) Bare, Anderson, and their children, Natalie, Avery and Emmaline Ruby; and Daisy Gangloff, Bourbon. Former daughter-in-law, Karen Gangloff, Bourbon; her brother, George (Linda) Humphrey, Brownstown; and three step grandchildren and their families also survive, Jamie, Brandon and Josh Woods. Per her wishes, the family will have private services at a later date. Memorial contributions can be made to Pretty Lake United Methodist Church 8085 SR 17, Plymouth, IN 46563, Humane Society of Marshall Co, PO Box 22, Plymouth, IN 46563 or Center for Hospice Care 112 S. Center St. Plymouth IN 46563.